HALEA’s Forgotten Mother’s Project targets teen mothers who live in Kampala’s slum areas. 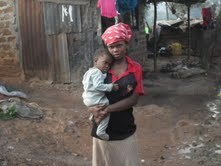 HALEA has started with young mothers living within Kagugube slum of Kampala Central Division. HALEA is currently encouraging young mothers to go back to school having realized that about 96% of young mothers within Kampala slums are school drop-out with no skills and sufficient education to guarantee them a bright future together with their dependants. HALEA has encouraged a total of 28 teen mothers to go back to school, 17 of them are currently at Kampala Student’s Centre, 3 at Grace Fellowship and 8 at HALEA computer Training centre. HALEA supports young mothers to attain income generating skills and further education.This project that began in 2009 has over 50 beneficiaries learning computer skills and getting further education they had earlier missed when they become pregnant. HALEA is helping over 20 young mothers rekindle their lost dreams and find meaning in life. To achieve this, we have set up a young mothers support plan as an easy, fun way for individuals/donors and all well wishers desirous to help young mothers, build confidence, learn effective skills and start a life time of making a difference in our world.Time is now.Join us make a difference in their lives. HALEA is looking for devoted parents and donors – globally – who believe in the potential of young mothers to join us and help us help teen mothers in Uganda.